We are looking for 18-30 year olds throughout the UK to apply. Casting now for a new TV series for BBC Three. 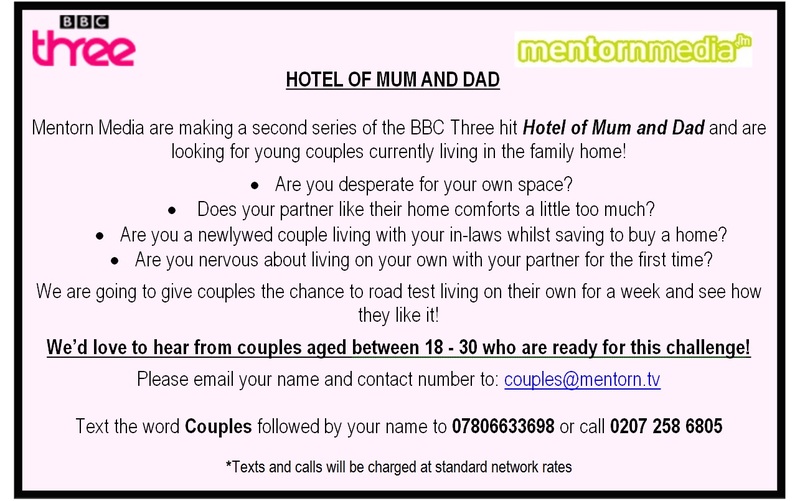 The programme is called ‘Hotel of Mum & Dad’, and we are looking for couples aged between 18-30, who currently live at home with their parents or in-laws. The idea behind the series is to give young couples the opportunity to road test independent living for a week. Once selected, we would provide the couples with a flat of their own and see how they cope trying to live to a budget (all paid for by us of course)! We’re looking to get a diverse range of contributors involved in the show. HAVE YOU HAD A BEAUTY PROCEDURE YOU NOW REGRET OR HAVE OUTGROWN? Maybe you’ve had face or body piercings, implants, flesh tunnels or other body modifications that you’d like undone? Or have you already removed them and been left with the scars? Perhaps you have tattoos that no longer fit your image? Or permanent make-up that you now regret? Does your look no longer match your lifestyle? Channel 4 is looking for women and men who want to reverse procedures they regret or have outgrown to take part in an exciting new series that explores the reasons behind doing and undoing beauty treatments. If you’ve had a permanent treatment and are seriously considering getting the work undone, we are interested in speaking to you. If you would like more information please email us for an application form at beautyregrets@endemoluk.com or call us on 0333 577 7741*. * Standard geographical charges apply. Calls from mobiles may be higher. Applicants must be over 18. We will use your information for the purpose of selecting participants for the programme and in the production of the programme and will only share information with the broadcaster and any independent contractors involved in the programme. My name is Vanessa and I am an Assistant Producer working on a new exciting primetime Channel 4 series about beauty fronted by former beautician, Katie Piper. Remarkable Television, are the Producers of Million Pound Drop, Supersize Versus Superskinny and Secret Eaters. This new series is due to air from the first week of September and we started filming this month and are looking for more people to feature! We are producing 6 x 1 hour shows looking at the reasons and motivations for have beauty procedures, cosmetic or non- cosmetic, done or undone. We are looking to feature people who may want to change their current look for any reason. E.g. Trends have changed, they have grown out of the look or it has hindered them gaining employment. If featured in the series, all costs for the undoing procedure will be covered as part of a lifestyle piece. It would be great if you could pass this information on to anyone you feel is relevant.